prisoners during the Korean War. In scorching detail, Raymond Lech describes the soldiers' day-to-day experiences in prisoner-of-war camps and the shocking treatment some of them received at the hands of their own countrymen after the war. Why, he asks, were only fourteen American soldiers tried as collaborators when thousands of others who admitted to some of the same offenses were not? 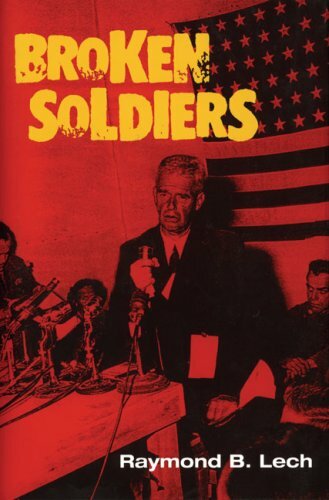 Drawing on some 60,000 pages of court-martial transcripts Lech secured through the Freedom of Information Act, Broken Soldiers documents the appalling treatment and the sophisticated propagandizing to which American POWs fell victim during the Korean conflict. Three thousand American soldiers perished in North Korean camps over the winter of 1950-51, most from starvation. Through the unsentimental testimony of survivors, Lech describes how these young men, filthy and lice-infested, lost an average of 40 percent of their body weight. Many also lost their powers of resistance and their grip on soldierly conduct. subjected to a relentless campaign to educate them to the virtues of communism. Bombarded with propaganda, the Americans were organized into study groups and forced to discuss and write about communism and Marxism, even to broadcast harangues against capitalist aggression and appeals for an end to the war. Lech traces the spiral of debilitation and compromise, showing how parroting certain phrases came to seem a small price to pay for physical safety. Threatened with starvation and indefinite confinement in Korea, many POWs succumbed to pressure to mouth communist slogans and provide information far in excess of the regulation name, rank, and service number. Of the thousands of American soldiers who, while prisoners in North Korea, spoke and wrote favorably of communism and disparaged their country, a handful were charged with collaborating with the enemy. Why were so few singled out? Why did each branch of the armed services judge parallel circumstances differently, and why were American soldiers not realistically prepared for capture? troubling questions that remain unanswered decades after the events.